It's late after Shabbat and I'm pretty tired, but if I don't write this now, my head will explode and my heart will melt. The intense need to write? 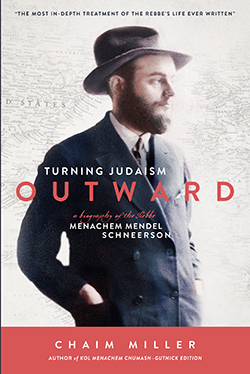 I finished reading Turning Judaism Outward today, which is the biography about the seventh Chabad Rebbe Menachem Mendel Schneerson written by friend and colleague Rabbi Chaim Miller (I worked with him on his chumash project several years back). I was well into the book when I went into synagogue today to discuss this week's parsha (Torah portion) with my women's learning group. Luckily, I'd landed the third aliyah, which was the bit about the people kvetching after Miriam dies because the water dries up, there's a brief mention of her death and burial, followed by Moshe and Aharon approaching HaShem with what to do. HaShem says to go, speak to the rock, and water will pour forth. Moshe doesn't bother asking what to say, but goes forth to the people, calls them a band of rebels, and smacks the rock with his staff. The result of this incident is that Moshe is destined to never enter Eretz Yisrael. As we talked about the parsha, I realized the significance of being the unwilling leader. Moshe was devastated by the death of his sister Miriam and the peoples' lack of realization that the water was because of Miriam's merit. Frustrated and at his absolute wit's end, he broke. HaShem knew the narrative, HaShem knew that Moshe wouldn't enter the land and needed an "out" in this narrative. It was at this point, where Moshe became truly human that it was possible to build the "exit strategy." It only made sense to me to tie in the "unwilling leader" to the Rebbe. I knew it before, but reading Turning Judaism Outward just reinforced the fact that the Rebbe never sought out leadership. Until he set foot in the U.S. and it was evident that his father-in-law (the sixth rebbe) had plans for him, he evaded leadership at every turn. I read this book awaiting the magical explanation for how he ended up in the role of the Rebbe and how the "Rebbe is messiah" movement, but there was never a firm point that either of these aspects of Rabbi Schneerson's life manifested. They were organic. There are several things I did learn for certain in this book that have provided me with a heightened respect and love for a rabbi I never knew. The Rebbe was a savant. He devoured literature and had a complete memory of the Torah, both Talmuds, and gobs of commentary. From childhood through the end of his life, he was able to give hour-long talks without even opening a book. The way that he processed information and relayed it make me wonder if the Rebbe had a touch of Asperger's, actually. As a savant who evaded public life and communal leadership, it would seem that he had these classic social trappings. I also found it frustrating that he was so well versed in the Yerushalmi (Jerusalem Talmud), because so many Chabadniks these days don't bother learning it or teaching it. The Rebbe clearly saw the value in knowing it, quoting it, and discussing it. The Rebbe was an engineering and mathematical genius. The stories that Rabbi Miller relates about his skill with understanding mechanics, machines, military plans, and so much more really blew my mind. I had no idea that he spent years in university getting an engineering degree and applied his skills and talents throughout his life to both relate to experts and to make suggestions to world leaders. Although he never stepped foot in Israel, the Rebbe had a deep love, appreciation, and passion for both Eretz Yisrael (the land of Israel) and Medinat Yisrael (the state of Israel). The amount of political and religious leaders he had deep and emotional ties with, not to mention the amount of times he wrote about the actions of Israeli leadership and the mistake they made show me that he was a man deeply in love with Israel. You also need to read the book to see a few of the moments when the Rebbe predicted something that happened and Israeli military leadership were kicking themselves. His foresight was mind-blowing. The Rebbe very clearly had a vision for Chabad after he died, and that was to look locally, to your local rabbis for guidance and answers. He was creating leaders to lead. He didn't need to name a successor because he believed in the Jewish people to lead themselves. He was a man who loved his wife in a deep and unwavering way that I cannot even begin to fathom. They met daily for a half-hour over tea. That was their moment to connect, reconnect, to be one. Although they never had children (and this is something I wish I knew more about, but it's still not covered in the book -- were there fertility issues? Her sister also had trouble conceiving, but I also know that this is a very, very, very private issue), they were deeply in love. The Rebbe did amazing things for education in America. He truly believed in reaching out to Jews and non-Jews, because he believed that everyone is capable of so much. The Rebbe was horribly frustrated with Chasidim viewing him as the mashiach (messiah). He never condoned it, in fact he spoke against it and the problems it would cause. He was very abrupt and to the point about this. 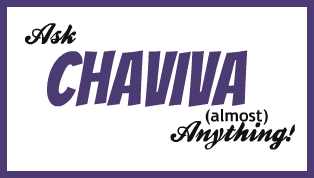 I think it's chaval (not a great translation, but it kind of means "a pity") that he spent the last 10 years of his life battling the mashiachists who tried to peg him as the messiah when it was something he so did not want, condone, or endorse. My own personal conclusion after reading this book and experiencing my eyes well up with tears as I spoke to Mr. T about what I was reading have shown me that I so feel for the Rebbe and everything he fought for and fought against in his life. He was a passionate, educated, wise Jewish man who believed in the Jewish people -- religious or not. The truth is that had I been alive in the 1960s or 70s and come to Judaism during those eras, chances are good I would have ended up Chabad. Nowadays, with the prevalence of the vision in Chabad as the Rebbe as messiah, I simply can't wrap my head around that. It's not something I'd ever be able to stand by and endorse as part of a collective entity. But I view it as dishonoring the Rebbe as opposed to honoring him to perpetuate the mashiach angle. I'd rather stand from the outside and share with the world the beautiful mind and heart and soul of the Rebbe than stand within and perpetuate something he stood so firmly against. The Rebbe is a man unlike any the modern world has seen. I compared his unwilling leadership to Moshe, after all. I wish I had been able to meet him, to be a Jew during the period of his life when something so special was happening. When the potential for greatness in the Jewish community was so palpable. At this point, all I can do is hope to honor the Rebbe through my own observance, through my own outreach, through my own storytelling. I can only hope he would have been proud of this Jewish woman had he known her. Here's a doozy, but one that's shockingly simple for me to answer at this point in my life. I know my answers probably sound grumpy and jaded, but less than two years in Israel made me more of a realist than I was before. What are your top 5 pieces of advice for someone considering making aliyah? 1. Save money. Save lots of money. Make sure you have enough money on hand to live for at least a year (that means rent, childcare expenses, grocery expenses, healthcare incidentals, buying a car, insurance, you name it). My biggest mistake in going to Israel as a single woman in her late 20s was that I didn't have a dime saved. I went with a nice income, but that income disappeared almost instantly. Not having anything saved put me into a nice amount of debt, which is no fun. 2. Buy lots of clothes in the U.S. before you move. Why? Because if there's one thing Israel doesn't have, it's any kind of clothing that will withstand more than a few washes in Israel's harsh water. Also? It's crazy expensive to buy something that will last. I know it seems superficial, but it's a good idea. I don't know many people in Israel that buy their shoes, electronics, or clothing in Israel. 3. Make sure you understand the impact of your U.S. bank accounts, especially if you're going to be transferring money back and forth. It can cost quite a bit of money to make transfers (e.g. Chase charges $40 for international transfers), and it adds up. If you have a U.S.-based income, have a plan in place for regular transfers. 4. Decide whether you really want to pay all that money for a lift. Moving stuff to Israel can be crazy expensive, especially when there's a readily available market for used furniture and appliances in Israel with all of the olim (immigrants) moving back to the U.S. and selling their entire property. If you can't live without it, take it with you, but make sure you really can't live without it. 5. Believe in the mission. If you make aliyah based on a dream or with expectations that life will not change much except that you'll be living in Eretz Yisrael, then you're going to be sorely disappointed and experience a huge shock. Make aliyah because you believe Israel is going to be the best home for you and your family, make aliyah because you believe in the nation and its principles and the understanding that Israel is home for the Jewish people. Don't make aliyah because it's going to solve all of your problems or provide you with a "better" life or fix things. Be realistic, but be passionate. Will I be financially prepared when we return to Israel? Probably not. But it's not the reason we're back in the U.S. I'm not here to make my fortune so I can return to Israel sitting pretty by any means. It would be nice, but, like I said, I'm a realist. Ready to ask a question? Be nice and ask away! Why did you move back to the US? I thought I addressed this question in a previous post, but in case you missed it: bikur cholim. How are you liking life back in the US? Are there things you missed here? Are there things you miss now? How is your British/Israeli husband doing with living in the US? Life back here is interesting. There are aspects of Israel I miss desperately (the Jewish community and feeling of Shabbat), but there are things here that I find super comforting (knowing the language, finding what I need in the store, farmer's markets, the superficial things). As for Mr. T, I think he's baffled by the customer service, kindness, and options available here in the U.S. It's the land of everyTHING, so it's easy to find what you need anywhere at any price. In a way, we're being very spoiled right now. How does Mr. T feel about being in the US? What is happening with iBoy? Is it hard being so far away from your stepson/Mr. T's son? Mr. T is having a hard time, and really why wouldn't he? He left his almost 11 year old in the care of his mother to move to the U.S. with his wife and infant son to take care of family things. The truth is, he's viewing it as a lesson for iBoy, to see the lengths to which he would go for family. If we had to leave Israel to be with family in the UK it would be the same story, just a bit closer (a two hour time change rather than a nine hour time change). But we're working with iBoy's mother to make sure that iBoy has plenty of opportunities to spend time with us in the U.S. In fact, he'll be visiting in a few more weeks for two whole weeks! Considering the most we got to see iBoy was a few days a week back in Israel, it will be a blessing to have him around consistently for so long. But remember: iBoy's mother has full custody of him, so bringing him with us wasn't even an option, unfortunately. That choice is up to iBoy now that he's older than 10. How is your husband handling juggling fatherhood with a son on each side of the world? Considering he stays home three to four days a week while I go into the office to work, he's doing marvelously. 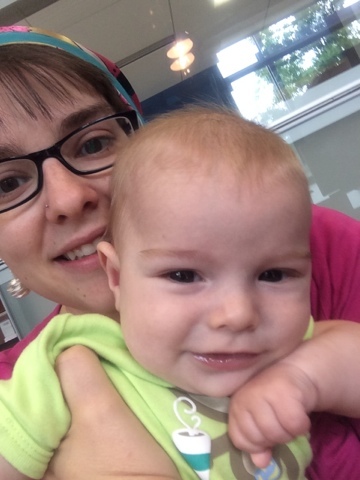 He's an extremely extroverted person, so having a non-speaking infant who is teething around 24/7 hasn't driven him mad -- yet. Ash and Mr. T speak to iBoy on Skype (when his mother's computer is working) almost daily if they can manage it. But time differences, dinner plans, and other things often get in the way and make it difficult for Mr. T to speak with his son, which is incredibly hard on him. But as Ash gets older and more interactive, not to mention when Mr. T is able to work in the U.S., things will become a bit easier on everyone, I think. I know you said you do plan to head back to Israel at some point, but honestly, reading your blog over the past few years, the place you've always seemed unambiguously the happiest is in Colorado, while you've expressed a lot of ambivalence about life in Israel. Do you really want to go back to Israel? It's true that I'm very happy in Colorado. The weather here does something to my emotions and psyche. I feel confident and happy and proud here. When I lived in Colorado in 2005, I was going through a bit of an awkward breakup and I found my confidence and self worth while here. When I came here after my divorce in 2011, I did the same thing. I found my happy place, I realized I was worth so much more than I ever thought I was. Now, being back, I wake up and see the sunshine and mountains and I feel like HaShem is really here. Is this the place everyone should be? Nah. It's just a place that makes sense for me. But that being said, Israel will always be the place we're meant to be. I wasn't always happy there, and I was frustrated with the language, the politics, the state of war, but you get to be Jewish in a unique way there. A way you can't be anywhere else. And that's something that is very important to me. On the other hand, what's going on right now in Israel makes me scared. Teenage boys being kidnapped by terrorists makes me scared. That could be my boy, my little Ash, in so many years. It could be iBoy. It could be the sons of friends of mine. That reality is horrifying. Yes, the U.S. is riddled with school shootings and kidnappings and horrible things, but here it's one psycho in one act of selfish psychosis. In Israel? It's a group of people with the unwavering desire to kill all Jews and destroy an entire nation. That's so much bigger, so much scarier. So, with all of that, I am ambivalent about life in Israel right now. Here I'm closer to my family, closer to comfort, closer to the "easy" life. But is that the kind of life I want to instill in my children and the future generations? I'm not sure. Only time will tell. "I have my first meeting with the Beis Din this week, and I am super nervous! Any advice?" That first beis din (also beit din, or rabbinical court) meeting can be a serious nightmare. Or, rather, it can feel like it's going to be a nightmare, and afterwards you might be kicking yourself for every little hesitation or self-questioning moment you experienced. Chances are you'll feel like you've failed, no matter how much you jazzed the rabbis with your knowledge of kashrut (Jewish dietary laws) or brachot (prayers). There's something about the process that is made to knock you down rather than build you up, for some reason. I don't think it's meant to be part of the process, but it just works out that way. So how do you prepare for that first meeting? One word: Confidence. If you go into the first meeting with unwavering confidence that you know your stuff, that you're confident in your choice to formally become Jewish, that you're knowledgeable and prepared to take on all of the mitzvoth (commandments) necessary, then it will show. The rabbis are looking for someone who can handle the pressures of both the process and what happens after you convert, which can be traumatizing if you're not prepared (rejection by family for converting, rejection by other Jews who don't think converts are sincere, bullying by other converts trying to protect their own skin by making other converts look bad, and so on). Practically speaking, it helps to have some of the brachot memorized (especially the ones on food, the shema, and other daily blessings) and to have a few anecdotes about any learning you've already done, books you're reading, and to know your own personal journey to Judaism according to how you've written it down for the beit din. Be sure to also be able to explain any inconsistencies or questionable things like if you're dating a Jew, if you have a parent who is Jewish, if you've visited Israel, if you grew up in a Messianic movement, and so on. Those are the tough questions you're going to want to be prepared for! Just stay true to yourself, be honest with the rabbis about where you are and how much you know, and also be sure to ask questions! Be curious, be passionate, and be confident. Have a question? Ask away! You can also read about my first visit to the beth din right here on the blog. For better or worse, I'm reopening the Q&A portion of the blogging experience. I'm sure there are a lot of questions out there, and I'm prepared to answer most of those questions. Have something to ask? Head on over to the form and get your anonymity on! 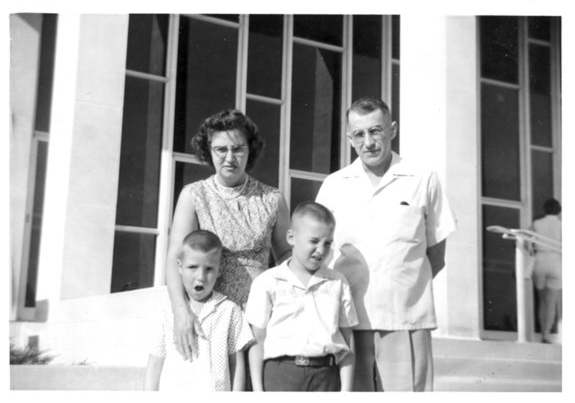 That's dad on the left making faces. Go figure. Born in August 1953, he grew up in the Midwest with an older brother and two parents who he doesn't remember a ton about, at least he doesn't talk much about them. There are small stories here and there that come up, something about hardboiled eggs I remember. Ethel, my grandma, died of lung cancer on her 39th birthday. My dad was 9. Joseph, my grandfather, died of a heart attack at 47. It was 11 days after my dad's 12th birthday. Dad grew up with a stepmother and joined the Navy as soon as he could. He often tells me about being stationed in the Mediterranean where he worked on the ship's computer. He likes to tell me about the work his ship did for Israel during the early 1970s, which I think is pretty rad. When he was 23 and my mom was 18, they got hitched and started a family in Kansas City, Missouri. Between the late 1970s and the mid-1990s we lived in Iowa and then Southern Missouri, my dad was a superstar-rockstar manager for a large building materials company that ended up taking their amazing employees for granted, going bankrupt, and the CEOs walked away with boatloads of money. But it didn't break my dad. He kept on trucking. He kept focusing on his family, working nights, working overtime, working hard and long hours to keep food on the table. Then my dad suffered through a quadruple bypass surgery, followed by a diagnosis of Lymphoma. But that didn't break my father either. Nothing has ever broken my dad. I can't get over how much he's been through (it seriously brings tears to my eyes) and how much he's been taken for granted by employers, employees, friends, family, you name it. He's the kind of guy who lays wisdom on you that you don't always get ("If wishes were fishes, we'd all be fishin'"). He'd bend over backwards to make sure a coworker is doing okay. He'd walk home miles if it meant he wasn't putting someone else out. He'd give up everything for his family's happiness (to a fault). He's really the ultimate hero. He didn't fight in a major war or jump in front of a moving vehicle to save a puppy or create a life-saving drug. He isn't famous. He isn't making or giving millions to save the rainforest or feed starving children. But he's a hero, of the unsung variety. Why? Because anyone who suffers the greatest losses and comes out still trying, still living, still loving ... that's a hero. To me, anyway. So tell me about your dad. Why? Because dads rock. They're amazing and they're undervalued in my opinion. Mr. T is an amazing dad who, much like my own father, would bend over backwards to help anyone anywhere (they do say you marry your father, right?). Then, if you love your dad and you love Target (ahem, who doesn't? ), enter the Power Dad’s Smile Everyday Sweepstakes with over $1,000 in prizes starting today! To Enter: Share a photo of you and your Dad on Twitter or Instagram using #oralbsweeps between June 2 and June 15. The Prize: You could win the Father’s Day Power Bundle which includes the Oral-B Black ProfessionalCare 1000 Rechargeable Toothbrush, the Braun Series 7 760 shaver, and a $250 Target Gift Card!